The 848 Titrino Plus is the best all-around automatic titrator for everyday use. The 848 is a multi-mode endpoint seeking titrator for routine titrations that do not require a high-degree of sophistication. The 848 Titrino Plus features dynamic (DET), monotonic (MET) and set endpoint (SET) titration modes. All Titrino Plus titrators also feature Intelligent Exchange Unit technology that will make sure that you never use the wrong titrant again! All Titrino Plus titrators now feature powerful and simple electronic data storage, processing and retrieval with new TiBase software! The installation of the 848 Titrino plus is designed to be exceptionally simple. Exchange unit, stirrer and USB compact printer are detected and configured automatically as soon as they are connected. Just as is the case with the high-end titrator Titrando, the new Titrino plus is also equipped with a high-resolution measuring input which guarantees results with the greatest of precision. The large display enables you to edit all of the parameters necessary for routine operations quickly and conveniently. After the start, the progress of the titration is always in view, thanks to the live curve. Mouse or keys – select your favorite! 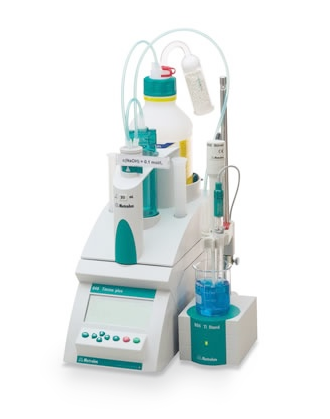 The 848 Titrino plus is the first titrator that can be controlled either per mouseclick or keyboard. The chip for the intelligent Metrohm exchange unit automatically provides the titrator with the data (cylinder volume, type of reagent, date of expiration for the titer, etc. ), that it requires to accomplish the titrations error-free. This means that you will always titer under optimum conditions and that you will not need, for example, to repeat any measurements because of an expired titer. Either a magnetic stirrer or a rod stirrer can be connected to the Titrino plus, which is then detected and configured automatically. The stirring rate is stored in the method, which guarantees a maximum in reproducibility. The optional 6.2148.030 USB/RS-232 adapter box enables the connection of laboratory balances and operation with a computer. 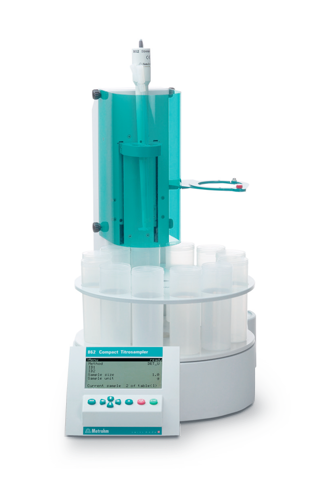 The Titrino plus, Metrohm's new entry class in the area of potentiometric titration, is particularly attractive due to its practically unbelievable price-performance ratio. A large live display with titration curve, "Plug & Play" functionality of exchange unit, stirrer and USB printer, a high-precision measuring input, operation per mouseclick – the Titrino plus offers considerably more than you would ever expect in this price segment. With its operating dialog, which is tailored to routine users, the Titrino plus instruments are so simple to operate that only brief orientation periods are required. Their robustness also makes them the ideal titrators for routine determinations in everyday laboratory operations. The installation of the 877 Titrino plus is designed to be exceptionally simple. Exchange unit, stirrer and USB compact printer are detected and configured automatically as soon as they are connected. The 877 Titrino plus is the first titrator that can be controlled either per mouseclick or keyboard. 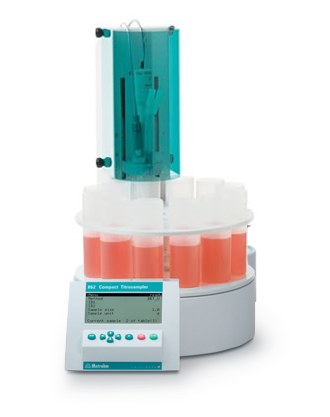 The 862 Compact Titrosampler - titrator and sample changer combined in a single device - is a fully automated titration station that occupies no more space than a typical analytical balance. In 12 positions different analyses can be carried out fully automatically and the electrodes cleaned and conditioned after each determination. Due to the large and clearly arranged live display the titration curve is always in view and the actual state of the sample series can be observed directly. Urgent samples can be given preference at any time. «Plug & Play» - functionality of intelligent dosing unit, stirrer and USB printer, a high-precision measuring input, controlling via mouse click as well as different dialogue options- leaves nothing to be desired. Just like the Titrando, the high-end titrator, the Compact Titrosampler is also equipped with a high-resolution measuring input that guarantees results of outstanding precision. The 869 Compact Sample Changer offers the rapid and simple automation of Titrino and Titrino plus applications. For multiple determinations and small sample series, this sample changer is just the right choice. A wide variety of titrations can be performed fully automatically in a total of 12 positions and the electrode can be cleaned and/or conditioned between the determinations. In order to keep the consumption of titrant and solvents as low as possible, slender sample beakers are used as standard equipment that enable low-waste and rapid titration with even small volumes. Thanks to the large and clearly organized live display, the current status of the sample series can be recognized directly and important samples can be given preferential analysis at any time. In light of the fact that laboratory space is expensive and rare, the compact sample changer requires no more support surface than that of a commercially available laboratory balance. Various method templates can be used as the basis for creating and storing application-specific methods. Only four parameters need to be set on the 869 Compact Sample Changer for this purpose. In addition, the methods can also be printed out or saved electronically via USB (OTG) connector. Communication between Compact Sample Changer and Titrino / Titrino plus takes place via remote signals with an additional control box or PC being required. The titration head of the sample changer offers space for an 802 Stirrer propeller stirrer and two additional electrodes. The propeller stirrer can be connected directly to the instrument and is also monitored by it. Titrant and auxiliary reagent can be added with the buret tips that have already been inserted. The 869 Compact Sample Changer can be equipped with rinsing and aspiration pumps upon request. Despite its inexpensive price, no corners were cut with respect to safety with the 869 Compact Sample Changer. The safety shield protects the user against inadvertent contact with chemicals.